The process of learning to drive in the UK includes having to pass both the Theory Test and a Practical Driving Test. The Theory Test was introduced in 1996, and has seen many changes since then. From 2002 The Hazard Perception Test was added as a seperate test, but taken in the same test session as the Theory Test. 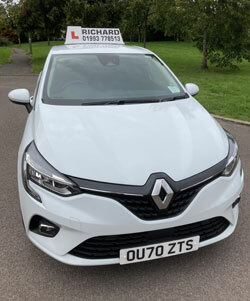 If you are taking a course of driving lessons your instructor should introduce some of the elements of driving theory during your lessons. Other books and DVD's are also readily available to help you prepare for the test. The Theory Test involves answering 50 multiple choice questions via a touch screen computer. 5 of these questions will be based on a case study (see below). The pass mark is 43. Some questions may have more than one correct answer. You are given an opportunity at the end of your test to go back and review your answers. A developing hazard is a hazard which will cause you to change speed or direction. Each hazard has a scoring window from 5 to zero marks. The pass mark is 44 marks out of 75 for learner car drivers. A candidate can not cheat the test by repetitive clicking as the test will detect this and award zero points for that clip. To book your Theory Test make sure you visit the official government website where you can pay for the test without any other booking charges. To book your Theory Test click here.